When Benny was dumped off in the Seattle Animal Shelter’s play yard in the middle of the night Oct. 3, 2008, it wasn’t for fun and games. 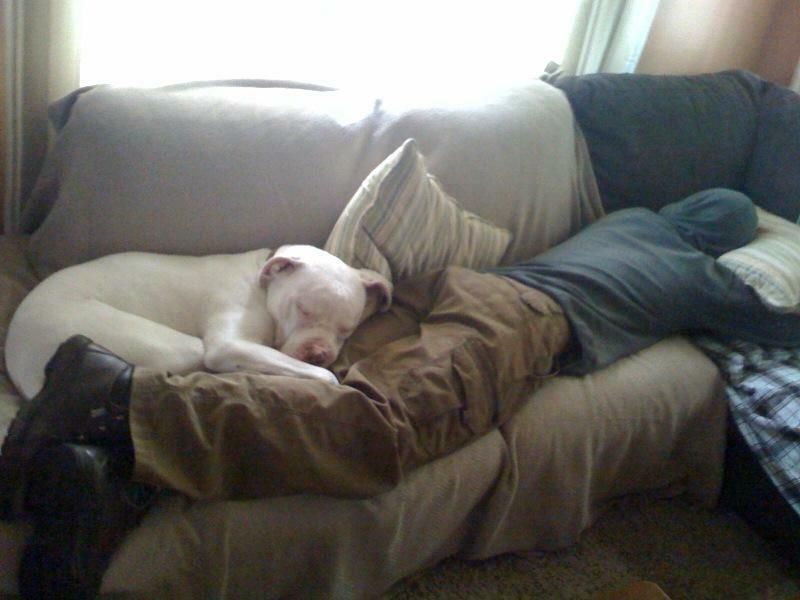 Like many pit-bull terriers, the 60-pound castoff was rambunctious, playful and a bit destructive. Add deafness to his profile, and the odds weren’t on his side for adoption. In other words, he was sitting on two strikes, and you know what strike three means for this breed at most animal shelters. And, for starters, he didn’t exactly endear himself to the staff that discovered him, having ripped apart about 200 plastic clean-up bags in the yard from their holders. When volunteers walked him, he often refused to relieve himself, waiting until he was returned to his kennel run to do so. On those walks, Benny (a name given him by volunteers) often jumped on the volunteers, nearly knocking some over. “These weren’t aggressive moves,” Kokernak added, “rather more excited, out-of-control actions.” Strike 2 ½. It was becoming apparent the all-white underdog was not a prime adoption candidate. Hence, on Oct. 20, Kokernak, a seven-year agency employee, volunteered to foster him, against the wishes of his longtime partner. “Our two older dogs had passed on and we had four senior cats at home (Capitol Hill),” said Kokernak. The dog split its time crated in the garage and in the house, when both Kokernak and his partner were home. Quickly, Sunny, a 12-year-old tortoiseshell, established who was boss, nailing the playful Benny when he made a sudden playful move toward her. Many days Benny accompanied Kokernak to the municipal shelter, where he was quartered in a kennel run. Recognizing Benny’s adoption hopes hung on improved manners and a patient, dedicated owner, in January 2009 Kokernak sought out Christine Hibbard, of Companion Animal Solutions, who specializes in private behavior consultations, in-home training and classroom teaching in the Greater Seattle area. So she took him, but four days later, she called Kokernak and reported Benny was “not working out” and she wanted to return him. The next day, they met at the Tacoma Mall, where she surrendered the dog. “It was very disappointing, but unfortunately it happens all too often in this job. It left me in a jump-start mode,” admits Kokernak. “I was attached to him, but I recognized he was a project, particularly his behavior toward other dogs at dog parks and on walks. He was not aggressive, rather defensive.” Add his deafness into the equation, and Kokernak had to totally focus on desensitizing Benny when other animals approached. Oct. 12, 2009 was a red-letter day in the Benny saga. “When I awoke I decided I wanted to keep him,” Kokernak.”I talked to my partner and he recognized how much Benny met to me. I continually told him, and I meant it sincerely, that I had no intention of adopting him but circumstances changed as the year progressed. 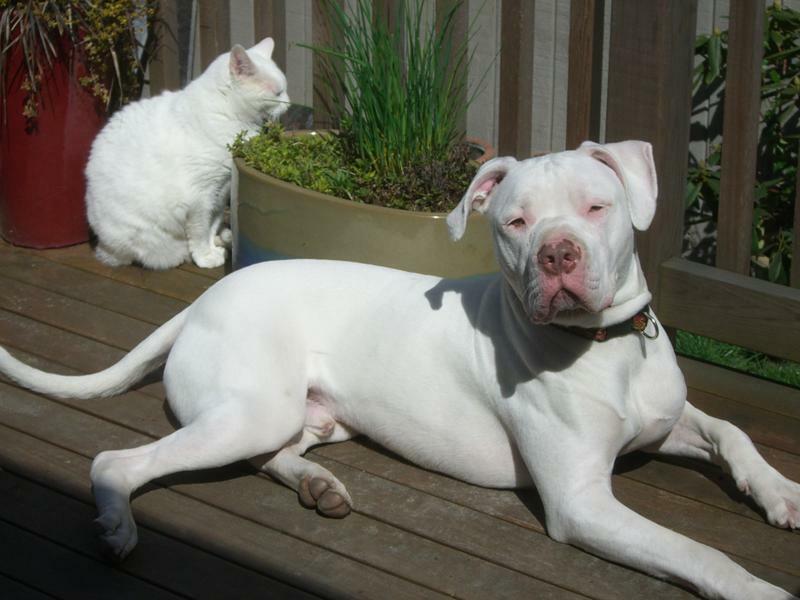 The majority of Seattle’s stray-dog population are pit bulls. 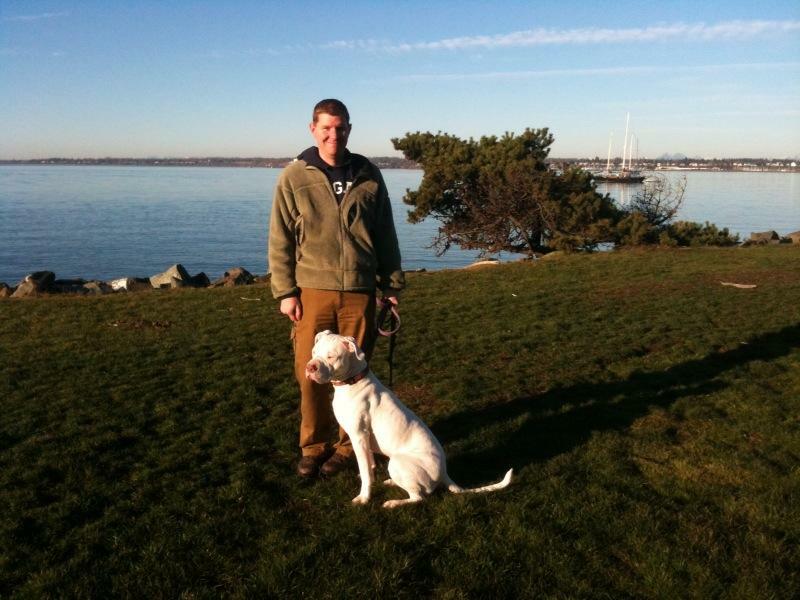 In fact, 43 percent of the dogs in Seattle Animal Control’s foster program are pit bulls or pit-bull mixes. Adult pit bulls, on average, take about 9 months to adopt as contrasted to 2 months for other breeds and breed mixes. Two years after being dumped at the shelter play yard, Benny has morphed into a couch potato and housemate to four cats, two Guinea pigs and a tenant’s Bichon Frise. Add to that a special connection between Kokernak’s partner and Benny and you have an inspiring mosaic built on hope and commitment. “I could not live with myself if I’d let this dog go,”Kokernak adds. Likewise, Benny owes his life to this compassionate officer who has seen the ugly underbelly of this much maligned breed reflected by countless euthanizations at the shelter.